Sometimes a perfect house doesn’t come with the perfect storage space to suit your needs – and that’s okay! A reputable home storage system company like Closet & Storage Concepts can help you design and install the storage you need for your home. Whether you need to improve the space in your pantry, garage, closets, or main living areas, there are plenty of ways to make room for your stuff. Here are a few custom storage solution ideas to help you make the most of your small or cramped space. Cramped Pantry – Way too often things get lost in the back of deep shelves found in typical pantries. Installing pull-out shelves and drawers is a great way to have easy access to everything you need. 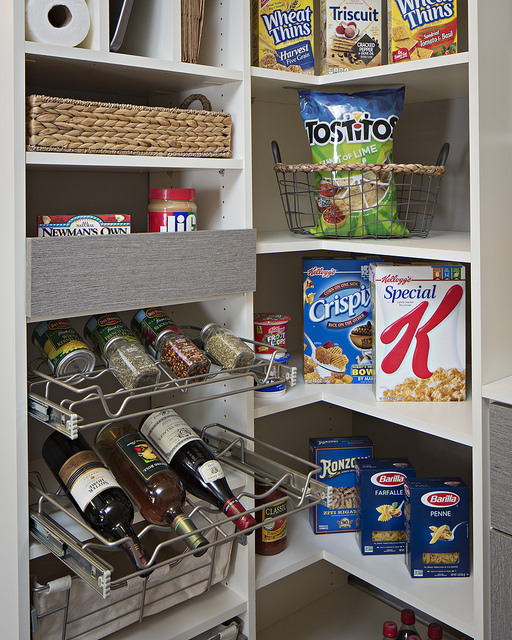 Include options such as cabinets, spice racks, adjustable shelves, and pull-out drawers and bins to customize your pantry for efficient storage. Small Closet – You don’t need to have a walk-in closet to reap the benefits of a custom closet storage system. Make your reach-in closet an efficient and fully-functional space by adding shelves, drawers, shoe racks, and cabinets. Also, consider accessories such as laundry hampers, tie and belt racks, and hanging rods, for less wasted space and great organization. Cluttered Family Room – A small family room can become cluttered and messy in minutes. Stop the clutter and get organized with a built-in entertainment center. It’s the perfect place to store your electronics, videos, books, games, and decorative accessories so you have more room and can hide the clutter! Overstuffed Garage – Organized your garage with storage solutions such as cabinets, a workbench, bins, shelves for sports equipment and tool storage, and more. Professional design and installation advice from your locally-operated Closet & Storage Concepts team can help you determine your needs and convert your garage to an organized clutter-free space. 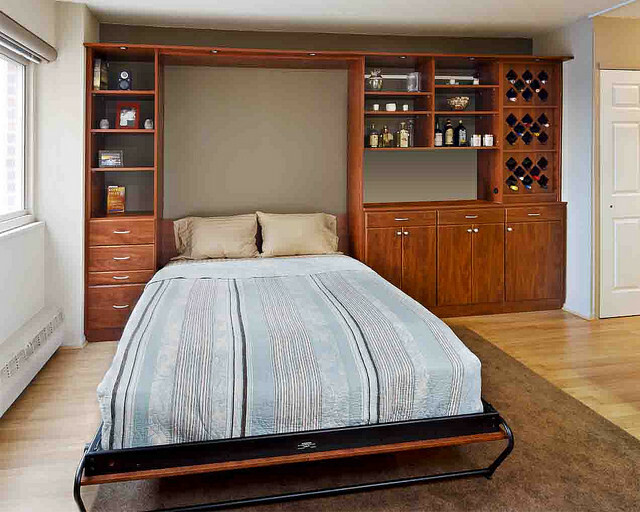 Tiny Spare Bedroom – If your guest bedroom is small, consider a wall bed! This type of bed is stored in a cabinet that frees up valuable space that you can use when you don’t have visiting guests. Use your spare room for a home office, media room, craft space, or other day-to-day activities by utilizing the extra space a bed would normally occupy. Simply fold the bed away into its cabinet when not in use and free up the room for other activities. At bedtime, open the cabinet to reveal a bed, ready to go with linens and pillows! Make the most of your space with custom storage solutions and enjoy the extra room, storage, and organization in your home! Get started by reaching out to a local team in your area.